Outdoor Learning Environment (OLE) is the term used for the licensed outdoor space of childcare centers in the North Carolina Childcare Center Licensing Rules. The Natural Learning Initiative (NLI) considers design of the OLE as a preventive health intervention to support children’s healthy development, including increased physical activity and adoption of healthy eating habits. 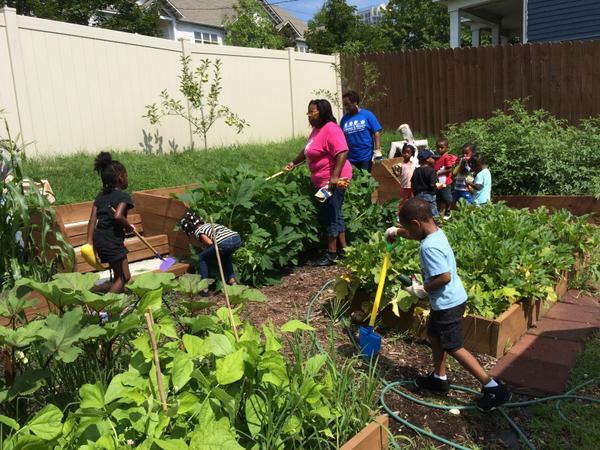 Settings where children and teachers can engage in hands-on fruit and vegetable gardening are an essential best-practice indicator of a high quality OLE.1 Gardening with children provides numerous opportunities for building the science skills of observation, inquiry, and experimentation. 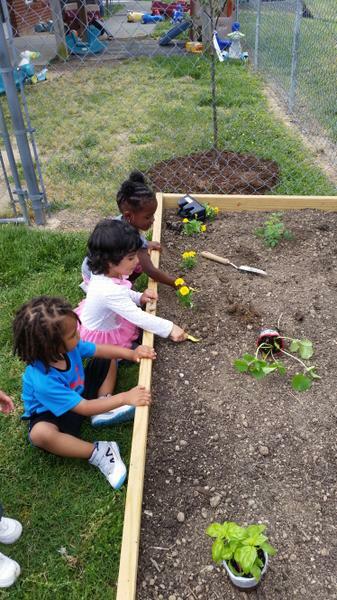 When children participate in growing their own food, they are more motivated to taste, eat, and enjoy the produce resulting from their efforts. Gardening also helps children build an understanding of and respect for nature and our environment. With some planning a garden can be designed and installed to suit the needs of the children and teachers, providing endless opportunities to enrich the learning environment. Dream big, start small, and have fun! Observe which areas of the OLE receive sun at different times of the year, and check present sun patterns with children for a few days. Which area gets the most afternoon sun? A vegetable garden will do best in an area that receives full sun for most of the day. Pick an area that is easily accessible from the center building. Closeness makes it easier to pay attention to weeds, insect pests, watering needs, and ripening vegetables. Fruit and vegetables require nutrient-rich, well-draining soil. If using an existing planting bed, soil samples can be sent to the NC Department of Agriculture & Consumer Services, Agronomic Division to determine if any amendments are needed. Relatively flat ground makes construction of beds and circulation in and around them easier. Consider proximity to a potable water source; the closer the better. Use existing structures like a boundary fence. This provides a protected back to garden beds and a vertical surface for vines (such as cucumbers, tomatoes, and beans). Provide storage for garden tools and materials. Locate the garden next to existing storage or where new storage can be constructed. 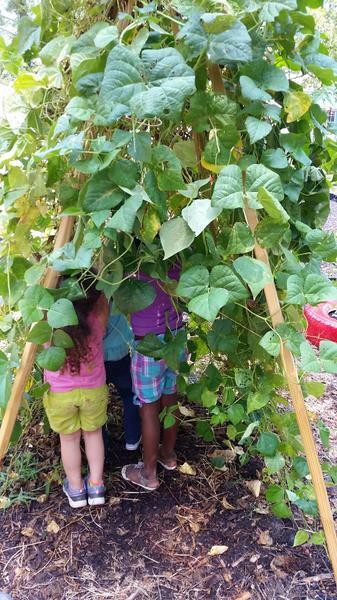 Harvesting beans from a vine-covered teepee. Raised or In-ground Planting Beds? 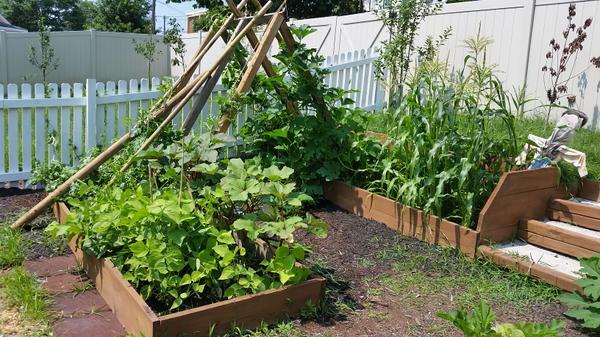 Raised beds offer easier access for both children and teachers. Defined edges make plants less likely to be trampled by little feet. Soil in raised beds tends to warm up sooner in the spring and allows planting of summer crops a few weeks sooner than in-ground planting beds. Edges define boundaries between adjacent surfaces like lawn to help prevent grass from spreading into the growing bed. Wood framing allows seating, work surfaces, and storage to be integrated into the garden setting. In-ground beds may cost less, but they can require greater investments of time in soil preparation and long-term management. An open space is good for sprawling plants, such as sweet potatoes and melons, and for mixing in flowers with fruit and vegetables. In-ground beds can be designed as large walk-in gardens. Stepping stone paths allow for a diverse mix of plants in one place. Children and teachers can re-design the garden seasonally by reconfiguring the pathways. Diverse planting of vegetables, herbs, and ornamental flowers in a childcare OLE. Transplanting seedlings in raised beds. Once the general location of the garden has been selected, the number, size, and spacing of garden beds can be decided. Keep beds narrow so that children can reach the middle of the bed from both sides (no more than 3 to 4 feet wide). Space garden beds far enough apart to allow room for children to walk between them (2 to 3 feet is good, 18 inches minimum). To test the planting bed layout, use spray chalk (available at hardware stores), a garden hose, or a length of rope laid on the ground to mark bed outlines. Or sprinkle flour on the ground in the shape of the beds to ensure the garden bed size and spacing is appropriate for the space. A-frame support for vines bridging raised beds. Raised planting beds are fairly simple to construct. Use long-lasting materials such as cedar, redwood, composite, or treated lumber. Do not use railroad ties or older, reclaimed treated lumber to construct raised beds, as these materials may contain hazardous chemicals. Before constructing raised beds, clear existing vegetation from the garden area. Lay sheets of cardboard on the ground at least a week before construction to help kill existing ground cover. To build a simple timber raised bed 4 feet wide by 8 feet long and 10 inches tall, purchase three pieces of dimensioned lumber that are 2 inches × 8 feet × 10 inches. Cut one board in half to create the 4-foot end pieces, and use the remaining 8-foot pieces as the longer sides of the bed. Use 4-inch by 4-inch posts cut to 1-foot lengths set vertically in the corners to help stabilize the beds. Fasten boards at 90 degree angles with galvanized screws. Fill beds to the top with a blend of half good quality garden soil and half compost (available at garden centers, home improvement centers, or local landscape suppliers). After planting, top beds with 2 to 3 inches of triple shredded hardwood mulch for weed control and moisture retention. 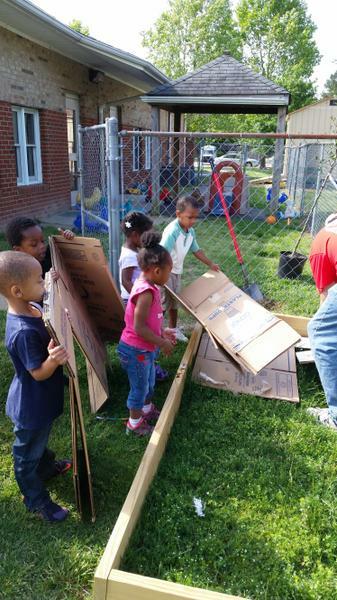 Preschoolers tending the raised-bed garden - and having fun. Design options for in-ground planting beds depend on the shape of the available space. Traditionally, an in-ground garden is either square or rectangular in shape, with pathways laid out in a grid and planting beds between paths. Unless the area has been cultivated before, compacted soil will need to be tilled before planting. Amending the soil with good quality compost will help with drainage and soil fertility. Spread 3 to 6 inches of compost evenly over the garden area, and till to a depth of 6 to 12 inches. Many of the clay-based soils of North Carolina are more acidic than the optimal growing range. A soil test will determine if lime is needed to raise the pH to an optimal range. Soil testing kits can be obtained from your county Cooperative Extension center. More information can be found at: http://www.ncagr.gov/cyber/kidswrld/plant/soiltest.htm. To control weeds and lawn grass invasion on pathways, cover the ground surface with recycled burlap coffee sacks, cardboard cut to size, woodchips, or stepping stones. Laying cardboard on the ground to kill weeds and grass before adding soil to the raised bed. In the South, garden space can be maximized to provide year-round gardening and learning opportunities by installing both warm- and cool-season gardens. Refer to other publications in the Local Foods series for additional Information. Growing Warm-Season Fruits and Vegetables in Childcare Production Gardens (LF-007-03) and Growing Cool-Season Vegetables in Childcare Production Gardens (LF-007-04) provide lists of warm- and cool-season vegetables, growing recommendations, and planting dates. Snacking and Cooking with Warm-Season Produce from Childcare Production Gardens (LF-007-05) and Snacking and Cooking with Cool-Season Produce from Childcare Production Gardens (LF-007-06) offer child-friendly recipes describing how to prepare and cook OLE garden produce. For those living in other US Department of Agriculture regions, contact your local Cooperative Extension agent or nurseries for guidance on planting choices for your region. 1 Natural Learning Initiative. 2014. Outdoor Learning Environment Toolkit. College of Design, NC State University. Funding for this publication was provided in part by the John Rex Endowment. The authors wish to express appreciation to Chris Gunter, Nichole Huff, Susan Jakes, Debra Ireland, and Barbara Scott for their assistance in preparing this publication.